To meet Carlo Matos is to view a dichotomy. A rare breed of what can be termed a Renaissance man in that his skills and interests are varied and broad, and like a stormy winter sky, constantly changing. The reach of Matos’s life leads him towards the violence and excitement of kick boxing and MMA cage fighting and then to the soft side where he writes poetry, plays and teaches literature. His days are well-rounded on the home-front as a devoted family man to his wife Nichole and young son Alex. Originally from Fall River, MA, Carlos is a first generation Portuguese-American writer whose family roots started in São Miguel island in the Azores. Weekdays find him in the classroom, teaching. Weeknights he coaches and fights in the MMA league as “Tim the Professor.” Most weekends, he can be found reciting poetry at the Chicago Poetry Bordello, a theatrical troop who hawks their wares at various venues throughout the second city. 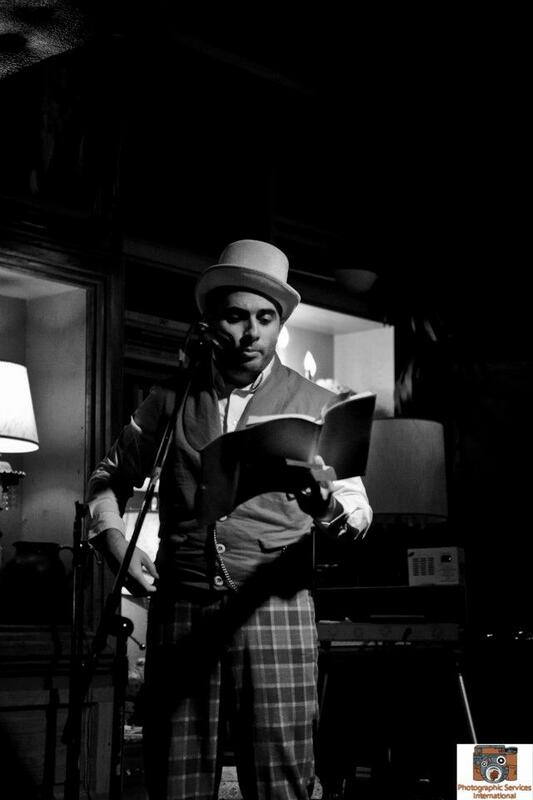 Matos dons a top hat and bold plaid pants pandering not elicit favors but poetry. The bordello, where poems are sold for cash and the ambiance is red velvet and on the sleazy carnival side of 1700’s Chicago. Matos’ published books include two poetry collections, A School for Fishermen and Counting Sheep Till Doomsday and a literary criticism book entitled, Ibsen’s Foreign Contagion, a ground-breaking discussion about the connection between contagious disease and the London stage during the birth of modernism. Q. What about being Portuguese-American informs your poetry, your writing? Many of my obsessions over the nature of work come from being an Azorean-American. Even as a young boy, work was something that was on my mind. My parents both worked in the last remaining textile mills in the small New England city of Fall River. Fall River, as you may know, has a large Portuguese community. My parents, along with most of the people they knew, worked in these mills, and they used them as a way of terrifying us. They would warn my brother and I that if we didn’t do well in school, they’d force us to work with them. Long hours, terrible pay, back-breaking work. I was truly scared. For me, destiny, fate (very important words for an Azorean) was a question of whether or not I could escape the horrors of a soul-killing job. It didn’t have to be just the mills. I worked in a donut shop, a gas station, a movie theatre (OK, that last one was actually kind of fun) but it was never an inevitability that these were only part-time jobs like it was for my American buddies. Any of those jobs could’ve been it for me and I just wanted something else, something more. The problem was that I would have to go get it from the American world—a world I belonged but did not belong to. This obsession has grown as I have watched our entire country utterly lose its mind when it comes to working conditions. And maybe it’s not just our country. No job is safe now from those hideous factory-floor conditions. We are a country that does not value time—the one true thing we cannot get back, the one thing we cannot bargain for more of. This concern has only grown more pronounced in my work as I have aged. Q. What is your literary background? Literature and theater. As a young boy, I wrote poetry. Some part of me always wanted to be a poet. Some of that has to do with the fact that my father wrote poetry in Portuguese—although he has never published any of it. So I’ve written poetry basically for my entire life, although it isn’t until 1998 before I would write any poetry worth reading. I tend to count that year as year 1. I went to UMass Amherst for college where I double majored in English and Theater. It didn’t take me long to decide that I wanted to be a director and playwright rather than a performer. I liked the big table. When it came time to go to graduate school, I had to decide if I was going to pursue an MFA in playwriting, an MFA in directing or a Ph.D in literature. So what I did was apply to all three. It was a hellish process. Basically I let destiny choose. Whoever gave me the best deal, that’s where I’d go. And, interestingly enough, UMass gave me the best deal, so I stayed there and got my doctorate. My dissertation, which was recently published by Academica Press, focused on Ibsen, contagion and the London stage. At the same time, I continued to pursue my playwriting career and that is how I landed in Chicago. I spent ten years pursuing scholarly, poetic and theatrical ambitions, and once again, I let destiny choose—not consciously, of course. This wasn’t my plan; it’s just how things played out. And poetry ended up being the thing. Q. Can you describe your family’s heritage? It’s hard to unravel. I’ve heard so many stories. Few of them add up, so I will give you an account of the family that may have little to do with reality, but it is the only complete story I have of them. Both of my parents are from São Miguel. My father is from the village of Mosteiros and my mother is from Pico de Mafra. My mother’s family moved to the States when she was 12. Supposedly, on a trip back to the Azores when she was a bit older, she and my father fell in love. They had known each other in the past, but they were not romantically involved. My mother returned to the United States with a promise from my father that he would come for her after he got out of the military. In the states, this would sound melodramatic and ridiculous, but anyone who understands the power of saudade on the Portuguese psyche will not find it surprising that he followed through on his promise. He came to America when he was 21 and they got married. I followed shortly after. Q. Who are your favorite writers? Can you share a memorable line or passage? This, as you know, is an impossible question. But since I do not like it when people duck this question, I will answer it if we keep in mind that I would give a completely different list tomorrow and the day after. The poet who has influenced me the most in the last ten years or so would have to be James Tate, especially his prose poetry in Return to the City of White Donkeys. Ted Hughes, because of his epic vision, is always on my mind. And Simon Perchik—because of his unmatched control of language—is the most important influence on me now. His Hands Collected is a masterpiece. I am also influenced by the novels of Murakami—Kafka on the Shore is unreal—Richard Powers and, not surprisingly, José Saramago [Portuguese writer and recipient of the 1998 Nobel Prize in Literature]. But no astronomer can find where it is. Q. Is there a word or song or Portuguese phrase that speaks to you, in your life or your writing? For me it is “poor thing” it makes me work harder. Com Que Voz (what with a voice) by Amália Rodriguez is one of the most powerful songs I have ever heard. It speaks to all of those things, those passions, those yearnings and desires that I associate with the Azorean part of my temperament. All of those decidedly un-pragmatic, un-monetary, un-conventional feelings. Azorean-Americans, in my experience, are a weird contradiction. On the one hand, they are salt of the earth. They are people who know how to do things, how to get things done. They are adults! They understand responsibility. This is something I deeply respect about them. But, at the same time, none of those things seem to negate the fact that they are all poets, singers, musicians, storytellers and even sorcerers. It works. I don’t know why and that’s what I love about them, about us. Q. What did you or do you hope to accomplish in your book Counting Sheep Til Doomsday? Doomsday is a collection of prose poems. The way the book is organized is that the prose poems slowly count up—paragraph length-wise—until we get to “Insomniac’s Cookbook.” That is, two line poem, three line poem, four line poem, etc. I broke the counting in a few places because I didn’t mind if there was a little inertia in the system because some poems just needed to be in other places. I think every reader will get the gist of the conceit. It’s not that big a deal to me that it isn’t perfect. I’d rather have the poems in the right place than slavishly keep to a simple conceit like that. Actually, I was listening to a ton of Fado while writing the book. It’s not a coincidence that the first nine poems are all titled “Fate.” If one looks closely, Portuguese themes are there—just not in the same way as Fishermen. The book ends with a poem ostensibly about insomnia, but it’s really about breakdown and it’s a breakdown brought about by a baby. The book is loaded with baby images, none of which are cute or reassuring or any of those things. It’s not about babies; it’s about finding oneself in a place one had planned for meticulously only to find that you are utterly, totally and completely not up to the challenge. It’s about the moment when you fear you are not the person you have worked so hard to become. It’s about finding out that you may not believe in fate but she believes in you. The musical composition that ends the book is both serious and a joke. The poem is serious—farts or not farts. Again, the old world table, this is Portuguese hospitality, a thing of great and dire importance. I asked my old friend, the composer Stephen Jean, if he’d score it for farts and burps, which he did. It is Gabriel blowing his horn to bring in the judgment, just not with his lips. I want to go out laughing. Q If there is one line or title in your work that you would like to be remembered by, what would it be? when you were a child on her lap demanding nothing. Millicent Borges Accardi is the author of three poetry books: Injuring Eternity, Woman on a Shaky Bridge and Only More So. She is the recipient of fellowships from the National Endowment for the arts, the California Arts Council, and Canto Mundo. Carlo Matos is the author of two poetry collections, A School for Fishermen and Counting Sheep Till Doomsday and a critical book Ibsen’s Foreign Contagion. He teaches English and writing at Truman College in Chicago.